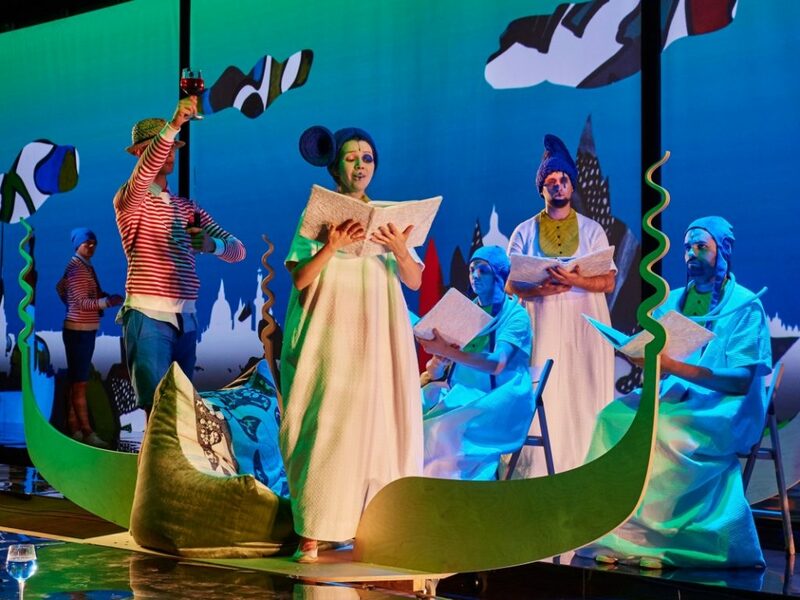 "The Blue Bird" (2015), by Maurice Maeterlinck, directed by Boris Yukhananov at Stanislavsky Electrotheatre, Moscow. English supertitles by John Freedman. Photo: Andrey Bezukladnikov. John Freedman was Theatre Critic at The Moscow Times from 1992 to 2015 and is currently Assistant to the Artistic Director at the Stanislavsky Electrotheatre in Moscow. In the interview below, Freedman reflects on over twenty-five years as a critic, scholar, and translator on the Moscow theatre scene, recounts efforts to bring about U.S.-Russia theatre exchange, and explores the artistic sensibilities behind the Electrotheatre’s unorthodox, distinctive, and magnetic repertoire. Yan Chen (YC): When you first came to Moscow to do research for your Ph.D dissertation, were you interested in the contemporary Russian theatre scene from the very start? John Freedman (JF): I came to Moscow to study the 1920s and ’30s in Soviet theatre, specifically the playwright Nikolai Erdman, and I was completely immersed in the past. All day long, I’d be in the archives, or doing interviews with people, talking about the past. The 1920s in Russian and Soviet theatre was an incredibly active time. Stanislavsky, Meyerhold, Tairov, and Vakhtangov were all active then. But here I was in 1989, and I felt a deep kinship between the two eras. I had the incredible good fortune to plug into a very rich theatre culture that was undergoing huge changes just as I was studying a long-gone theatre culture that also underwent huge changes. So I began following contemporary theatre too, and it became an obsession very quickly. As soon as I finished my dissertation and the ensuing book, I ended up spending all my time in the present. Jessica Hinds-Bond (JHB): When did you become the Theatre Critic for The Moscow Times? JF: That was 1991, before The Moscow Times became The Moscow Times. There was a theatre group called the Sibilyov Studio, started by a student of Anatoly Vasiliev’s, that I became very interested in. Every time they did a show, I went to see it. One night, a woman approached me. She said, “I see you around the theatre a lot. Have you ever thought about doing anything with it?” I said, “Doing what with it?” I had never been interested in being in theatre myself. My interest had always been literature, and I always expected to become a literary scholar. She said, “This new newsletter called The Moscow Guardian could probably use somebody to write about the theatre scene.” For the next four to five months, I wrote in every other or every third issue. Then they said, “We’re turning into a twice-a-week newspaper. Do you want to come work for the paper?” I was hired at the brand-new Moscow Times in 1992. John Freedman. Photo: Olympia Orlova-Vilberg. That meant I had to begin learning to do the job of a critic. I made it up as I went. I went out and bought books by other critics, Stanley Kauffmann, Harold Clurman, Michael Billington. Kauffmann’s Theater Criticisms was my bible. I would read three or four reviews, and ask myself, “How does Kauffmann write a first line?” I imagine it as being the way Bob Dylan writes. He listens to a couple of old songs and starts to make things up on his own, using other things as a template. I did that for several years until I began to find my own voice. Over time I found I was looking into someone’s book less and less and just writing. 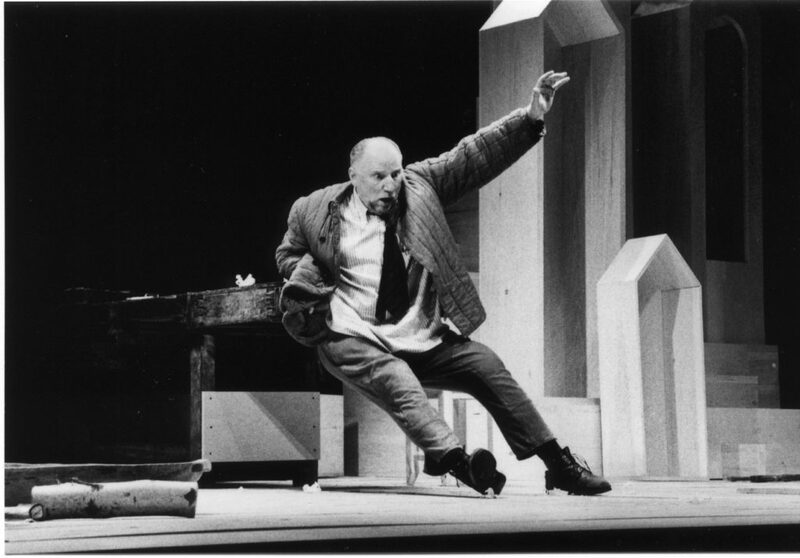 I found myself writing the history of contemporary Russian theatre for an English-language audience, and I began to take it seriously very quickly. You can go back through the stuff I did, even the really amateurish crap of the early years, and a clear picture of what was happening at the time still arises out of what I wrote. It was a fluke of fate. It all came about with that woman coming up and saying, “Have you ever thought about doing anything with it?” It’s never been “big,” but it turned into something that I know is important, and I ended up doing it for many other publications as well. I wrote some for The New York Times, American Theatre, The Stage in the U.K., and a lot for TheatreForum—a fabulous journal out of UC San Diego edited by Theodore Shank. All of these publications gave me an opportunity to record what I saw. I remember in my grad school days finding an obscure journal from 1932 in the Harvard library that had an eyewitness account of Meyerhold rehearsing Erdman’s The Suicide, and I just exploded with excitement! So, I know that what I’ve done will, at some point, give the ten or twenty people who are interested an opportunity to go back and experience something that they didn’t see. 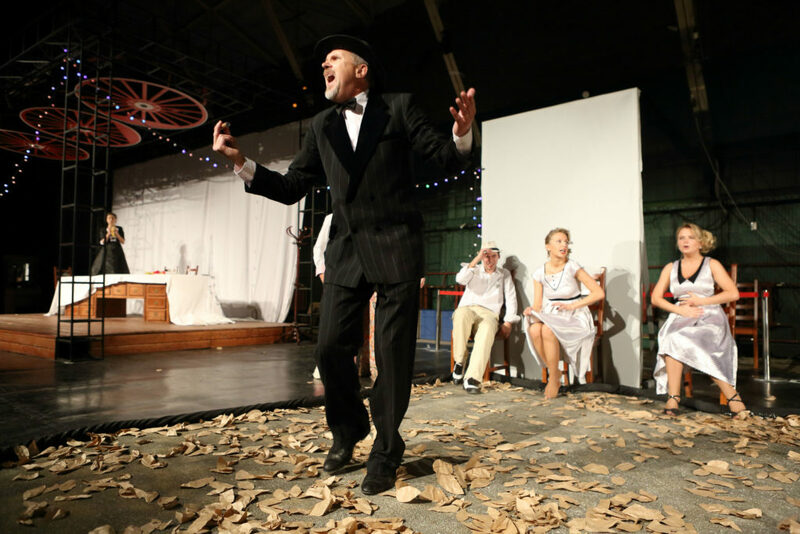 YC: What’s it like to write English-language theatre reviews in Russia? JF: It really marginalized me. In Russia, nobody had to pay any attention to what I was writing because I was writing in a different language. I’m not saying that with any kind of regret. I’m saying it as a fact. There were some people, Konstantin Raikin of Moscow’s Satirikon Theatre, for example, who were appreciative of my work. He often told me, or passed on to me, that what I wrote about his theatre felt very much like what he was trying to do. That gave me a sense that I was doing something of value, but I also realized that I existed in a very bizarre niche. And of course, people in the U.S. didn’t pay much attention unless they were specifically interested in Russian theatre. YC: Can you tell us about your efforts in bringing contemporary Russian theatre to the U.S.? JF: The American theatre, as a whole, is closed in on itself. I would have had virtually no impact on American sensibilities were it not for Philip Arnoult at the Center for International Theatre Development (CITD). We crossed paths in the early 2000s when he was trying to get American theatres interested in Russian theatre. He was bringing people over here, and I would meet with them, give them lectures, introduce them to people, and put together packets for them to read. But, in all honesty, nothing much came of it. I guess in the end, what I did was the work of a historian and scholar, although, for a while, I hoped I was going to help bring theatre in the U.S. together with theatre in Russia. Philip and I tried very hard, and we had some successes, especially “New Voices in a Shifting Age,” a fabulous three-year program at Towson University between 2007 and 2010 that presented ten new Russian plays in new American English translations. 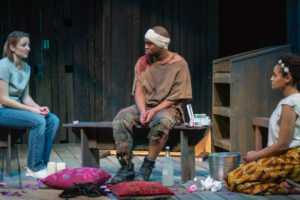 Generous Company’s 2010 U.S. premiere of I Am the Machine Gunner, by Yury Klavdiev, directed by Dave White at Baltimore Theatre Project. English translation by John Freedman. The production received funding from The Center for International Theatre Development (CITD) under Philip Arnoult and had a workshop production at Towson University in 2009. Photo: Rebecca Eastman. I was very naive. I really expected American theatres to be blown away by the incredible Russian writers. I got a lot of lip service but there was no sustained interest. I would run up against the strangest situations, like someone taking a new Russian play and using a British translation. I said, “You can’t use a British translation in the U.S.,” and they said, “We’ll just take out every ‘bloody’ and ‘chuffed’ and switch things around.” But you can’t do that! It is a fabric, a whole garment. You cannot take a British translation, do a few tweaks, and turn it into a performable American text. The production flopped and I wasn’t surprised. Another theatre told me it was definitely going to do something. I sent them a ton of plays. A year went by and nothing happened. They said, “Send more plays.” Another year passed, and I wrote them again. They replied, “We did a Russian project and it flopped, so we’re not doing any more.” I asked, “What did you do?” They had done an American adaptation of a Dostoevsky novel. I always felt I was up against a serious misunderstanding of what was needed. Two theatres, however, provided me some genuine solace. Joy Zinoman and the Studio Theatre in Washington D.C. did a whole Russian season in 2004-05. The public and press response to that was excellent. The other one was Graham Schmidt in Austin, TX, who had created Breaking String Theater, a house that staged Russian drama exclusively. He and I got together long distance—Graham in Austin and me in Moscow—with me translating and suggesting work, and Graham getting excited, taking it on, making his own decisions and producing it. Nobody in Austin had any inkling that they might have an interest in, or need for, Russian drama, but Graham manufactured that interest. 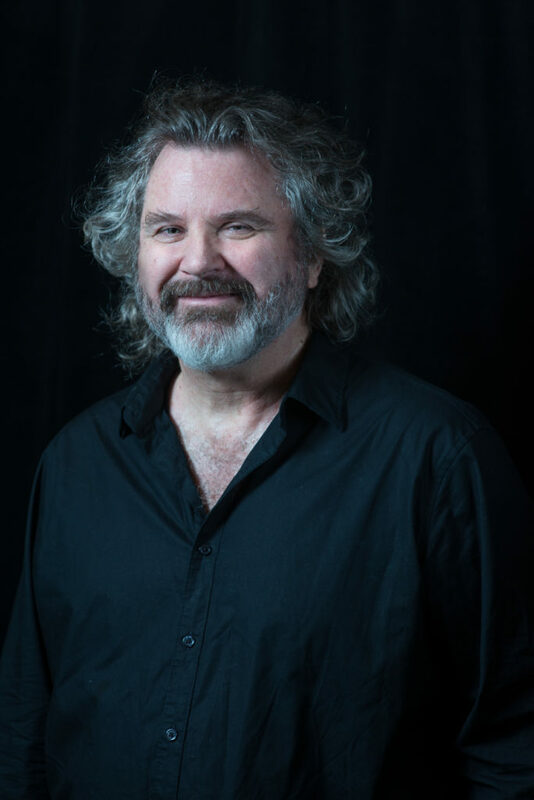 He put on five or six major productions in Austin over several years and did several Russian festivals with five or six readings in addition to a full production, seminars, and discussions. Frankly, to this day I don’t think Graham realizes what he accomplished over those years. YC: You’ve also helped bring new American work to Russia. How did that turn out? JF: That was a very cool thing, which, seven years down the road, is still paying dividends. It was another project that Philip Arnoult and I did together, called “New American Plays for Russia.” We were just finishing up the Towson Russian project, and we asked the obvious question, “Now what do we do?” Putting on my best Philip Arnoult thinking cap, I said, I guess after you’ve gone in one direction, you go back in the other and see what happens. Philip was immediately game. And then, again, I have to say: serendipity plays a role in so much that has happened in my life. After I had the talk with Philip, I got a call from the U.S. embassy in Moscow. It’s the only call I ever received from the embassy, I think. The caller was Michael J. Hurley, the Minister Counselor for Public Affairs at the embassy, and he told me there was a new program, the U.S.-Russian Bilateral Presidential Commission, set up by President Obama and then-Russian President Medvedev to facilitate U.S.-Russian cultural exchanges. He wondered if I had anything to suggest for it. I said, “Do I ever!” We brought representatives from the New York Theatre Workshop, Sundance Institute, the Eugene O’Neill Theater Center, and Humana Festival of New American Plays to Moscow, and showed them a week of Russian theatre, introducing them to writers, directors, critics, journalists and such. At the end of the week, we discussed what kind of American plays these experts believed might speak to the audiences, writers, and directors they had encountered. They started with a list of 100 plays, which, after six or seven hours of back-and-forth, were whittled down to seven that we translated into Russian. Those plays were then presented in seminars, readings, and festivals in at least ten to twelve cities in Russia. There have been at least a dozen major productions of these plays throughout Russia. Annie Baker’s The Aliens was extremely popular right from the beginning. Nilo Cruz’s Anna in the Tropics started slowly. It was the last of the plays to be produced but by now it’s been produced several times. 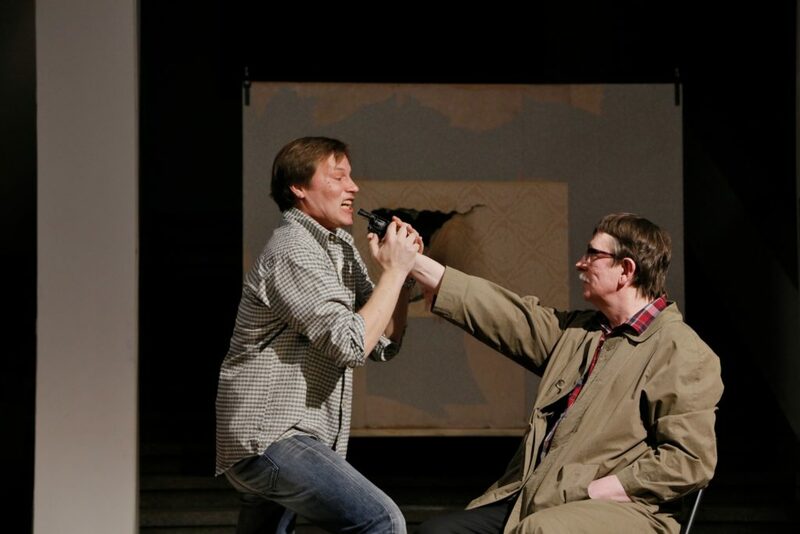 Nocturne (2012), by Adam Rapp, directed by Kama Ginkas at the Moscow Young Spectator Theatre, adapted by Maksym Kurochkin from a translation by John Freedman as part of the New American Plays for Russia Project. Photo: Ken Reynolds. The New American Plays for Russia project was extremely successful. It largely corresponded to what I thought was going to happen in the U.S. but never did. I must say I’ve always been impressed with the willingness of Russians to seek out and try things they don’t know. They’re real seekers who are not afraid of the unknown. I remember working at The Lark Theatre on plays by Olga Mukhina, a week after the 9/11 terrorist attacks. People were telling us, “You can’t write plays like this.” I was shocked. Frankly, I don’t understand what that means. All it can mean is that this woman is writing plays in some way different than you. But does that mean you “can’t write plays like that”? That’s silly. In fact, the plays that can’t be written—when they get written—are arguably the most important, interesting plays we have. They are the plays that break down barriers, the ones that say and do something new. They are the plays that reveal new voices breaking through. That phrase has stuck in my mind like a thorn ever since 2001. I don’t think I’ve ever heard anybody say anything like that in the Russian theatre community. 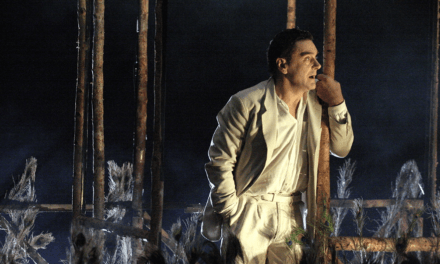 Anna in the Tropics (2015), by Nilo Cruz, directed by Alexander Ogaryov at the Stanislavsky Electrotheatre, Moscow, translated by Yevgeny Kazachkov as part of The New American Plays for Russia Project. Photo: Andrei Bezukladnikov. YC: I’d also like to ask about your work as a translator. You’ve translated many plays written in Russian into English, and you’ve done English supertitles for Russian-language productions, including those screened by Stage Russia. JF: I’ve done one for Stage Russia, the translation of Nikolai Erdman’s The Suicide, which is currently being screened. Most supertitles that I have done are for two theatres here in Moscow, the Fomenko Studio and the theatre I now work for, the Stanislavsky Electrotheatre. I really love doing supertitles. You want people to watch the performance, not read the show, and there is something incredibly creative about getting down everything that needs to be said in as few words as possible but doing it in a way that still flows. It’s the best way to present theatre across borders. Doing live translations gets in the way because the actors can hear the sound. Supers are the way it should happen. YC: When you translate supertitles, do you provide theatres with your translation of the text, or do you work in the rehearsal room? JF: At the Electrotheatre, I sit in once the show and my translation are both coming together, and I make sure that the phrases fit in terms of rhythm, tempo, and length. I don’t always have that luxury. When I work for the Fomenko Studio, I do the translation, and they put it in. Then I go and watch the performance and make sure that what I’ve done fits. For a two-hour show, I’ll probably make a hundred changes to what I’ve done. What you have may look wonderful on the page, but when it’s up there on a screen over the stage, it’s got to be perfect. The first supertitles I ever did were for Kama Ginkas’ Rothschild’s Fiddle, which had its world premiere at Yale in 2004 before it opened in Moscow. I sat in for six weeks during rehearsals, and I virtually did my translation in the rehearsal hall. Of course, that’s the way to do it. They were done together with everybody present—the director, the actors—and they were supertitles of the actual performance itself, not merely of the text. But the reality of our 24-hour day is that I usually do a preliminary translation at home, come to the theatre to check it, and then tweak it to fit what actually occurs on stage. It’s really great when I can do two or three tweaks. The 2004 world premiere of Rothschild’s Fiddle, adapted from Chekhov and directed by Kama Ginkas, at Yale Repertory Theatre. English supertitles by John Freedman. Photo: Ken Reynolds. YC: But you’ve been able to sit in on rehearsals at the Stanislavsky Electrotheatre since you now work there? JF: Absolutely. The shows there are very unusual. They’re not your common produced play. They’re multimedia, operatic, phantasmagoric productions, often with unorthodox or hybrid texts. It’s a particular challenge and one that I truly enjoy. Foreigners would most likely be completely lost at these shows without supertitles. 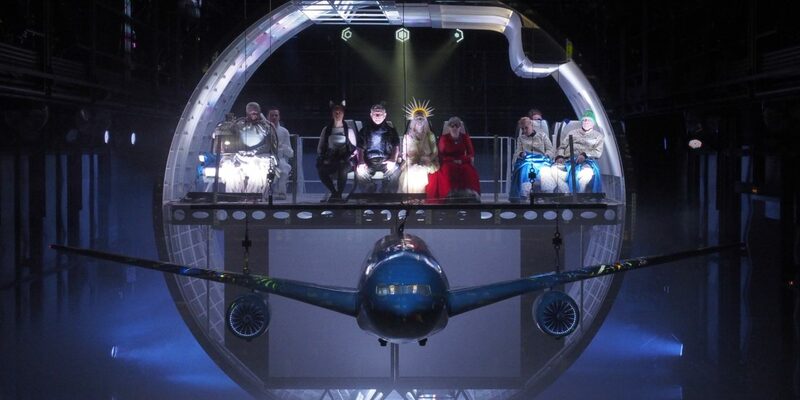 They would be fascinated by the spectacle of it, perhaps, because Boris Yukhananov, the Artistic Director, creates absolutely spectacular shows. But the titles pull them in and keep them together with the show. I’m very pleased that the Electrotheatre and Boris have made this decision to do what no Russian theatre has ever done—to make their theatre entirely accessible to an English-language audience, which, in actual fact, means the theatre is accessible to people from many countries and cultures. Anybody coming into the Electrotheatre immediately feels welcome because everything there is in English as well as in Russian: the advertisements, exhibits in the foyer, the website, even the marquee on the street. Many of the shows have subtitles to allow an audience to connect with them. The Stanislavsky Electrotheatre is accessible to the whole world and I love it for that. YC: Can you tell us what your role is as Assistant to the Artistic Director at the Stanislavsky Electrotheatre? JF: I’m the English-language voice of the theatre. Any public communication that comes out of the Electrotheatre is in English and Russian, and I’m very busy translating virtually everything the theatre produces. And it produces a ton of text. Technically speaking, I am a member of the International Department. We have cultivated some connections with England, and right now there’s quite a bit happening in Europe. I was tasked with making connections with American theatres, but people in the U.S. now are not interested in Russia. They’re suspicious and tired of hearing about it. Understandably so, but Russian theatre has nothing to do with the U.S. elections, and carrying over a lack of interest in Russia to Russian theatre is a big mistake. The world premiere of Octavia. Trepanation at the 2017 Holland Festival. 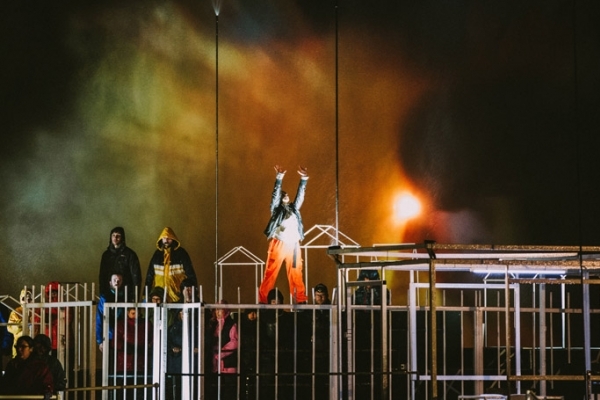 Music by Dmitri Kourliandski, libretto by Boris Yukhananov and Dmitri Kourliandski, directed by Boris Yukhananov, co-produced by the Stanislavsky Electrotheatre and Holland Festival. English supertitles by John Freedman. Photo: Andrey Bezukladnikov. JHB: Drillalians, produced by the Stanislavsky Electrotheatre, will be screened in April 2018 as part of Stage Russia’s current season. Last season and everything else this season are dramatizations of the classics or takes on the classics, but this is the first one that isn’t. Can you talk about Drillalians? JF: I believe Drillalians is a masterpiece ahead of its time. It is an incredible universe. Boris Yukhananov wrote a novel, which he later worked down to a verse libretto. The show runs ten to twelve hours overall. It runs five days, two to three hours a night. That would be a bit much even for the intrepid folks at Stage Russia, so their showings of Drillalians will be limited to the first two of those five nights. Yukhananov created this world of the Drillalians, people who move between earth and their own parallel world. It’s a story of the future, the present, and the past, all at once, because when Drillalians (aliens from the world of the Drill, if you get the drift) move back and forth from one world to another, they’re traveling in time as well. Boris called it a blockbuster when he was unveiling it in 2015 and he was probably right—he created an entire universe of people and places that, like Star Wars or The Hobbit, all have a coherent mythology and philosophy. It’s completely Russian, very esoteric and daunting, but thrilling and incredibly beautiful. It had six composers, so the music is very different each night, as are the sets, costumes, and entourage. This isn’t “the classics.” It has nothing to do with updated Wagner or Tchaikovsky. This is very, very contemporary music, presented from the very contemporary point of view of the director and author, Boris Yukhananov. I hope people will be curious enough to stick with it because it’s pretty spectacular. Stage Russia has become incredibly successful in the field of cultural and artistic exchange, and I’m thrilled that its founder, Eddie Aronoff Cardillo, came up with the idea. My hat’s off to him. 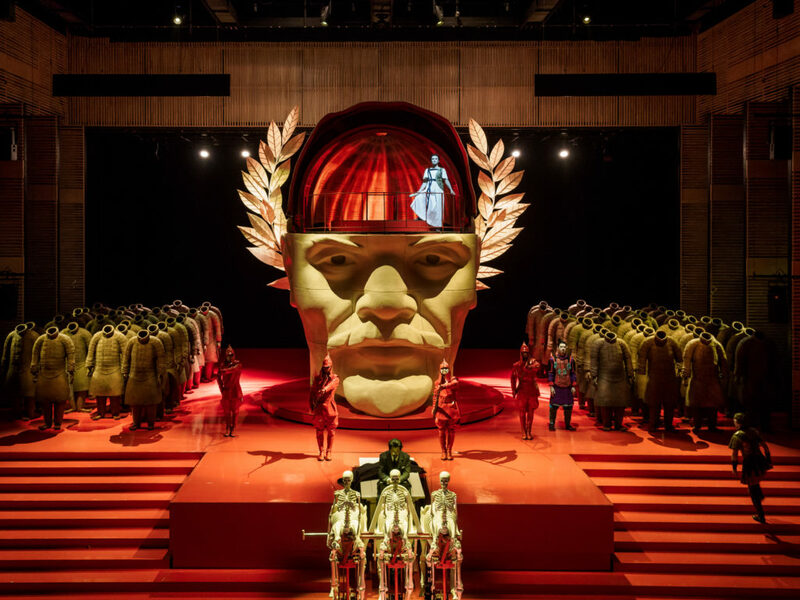 Drillalians (2015), directed by Boris Yukhananov at the Stanislavsky Electrotheatre, Moscow. Photo: Andrey Bezukladnikov. YC: Would you say that difficult but fascinating works like Drillalians are typical of the Stanislavsky Electrotheatre? What else makes it unique among Moscow theatres? JF: The starting point of the Stanislavsky Electrotheatre is not literature. This is a director’s theatre. Everything starts with the directorial vision, and everything else serves that. It’s also a very visual theatre. The Chief Designer, Anastasia Nefyodova, has a flair for wildness and craziness. People come out in costumes that bloom like enormous drugged flowers. She has a very strong influence on what Boris does at the theatre. There’s also her husband, Yury Kharikov, an old colleague and friend of Boris’. They have worked together for decades, and he’s also a spectacular designer who creates wild, crazy sets. Another thing one would not find in any other theatre in Moscow is the philosophy behind everything Boris does. Most theatres might say, “I have a great director who wants to do this show or work with this actor—let’s do it.” Boris is an intellectual. He underpins everything with a strategy and a philosophy. He’s able to contextualize, mythologize, and create a world of thought around anything that he speaks about at any moment. If he does a show, he’ll often do an art exhibit that ties into the show, or organize seminars or lectures that go along with the show. He’s always finding ways to contextualize and broaden the impact of the work. 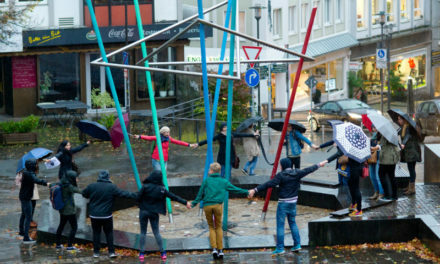 The theatre has a huge program called the Electrozone, which hosts lectures, meetings, discussions, film screenings, concerts, exhibits and much more. It’s a major enterprise run expertly by Kristina Matvienko and it is a significant companion piece to the productions that run in repertoire. Boris was one of the most important figures in Russian underground art in the 1980s and ’90s, and now he’s in charge of what used to be the Stanislavsky Drama Theatre, right around from Pushkin Square in the middle of the city. He took it over, closed it down for a year and a half, then reopened it as the Stanislavsky Electrotheatre in January 2015. That may make him mainstream now, but he’s not doing mainstream art. He continues to do his searching, inquiring, challenging art. He believes audiences will “consume” difficult, complex, exploratory art, and he’s working hard to prove that. When you walk into the Electrotheatre, there’s a sense that something is going on there, that there’s something really big in this space, greater than what you can see or hear. That’s cultivated very specifically by Boris. I’m not saying that the Electrotheatre is that much better than any other Moscow theatre, but I am saying that nobody does what it does. It’s a genuine multivalent world created by Boris Yukhananov and his team. He’s very good at bringing in people, listening to them and letting them do their work. YC: Speaking of Yukhananov being open to other artists bringing their visions into the theatre, there seems to be a consistent pattern of foreign directors, especially prominent European avant-garde directors, doing work at the Electrotheatre? JF: That was a very specific plan of Boris’. 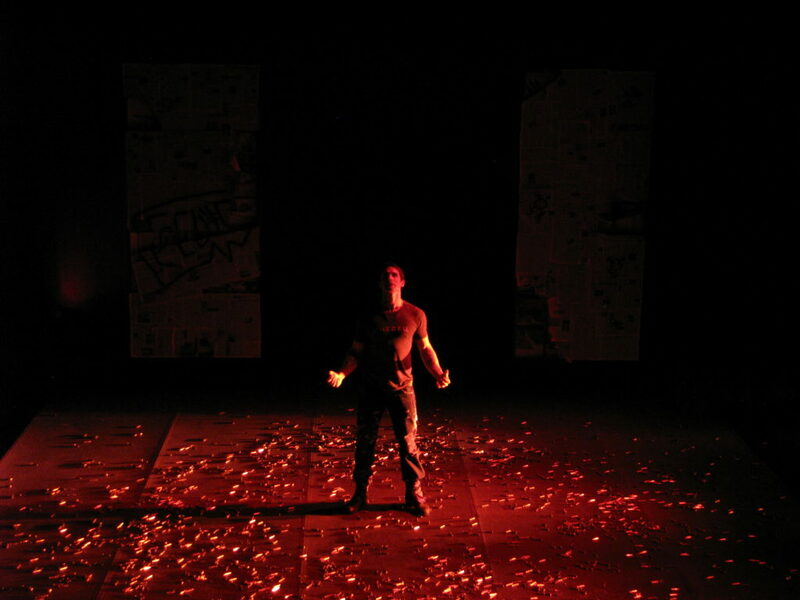 In fact, he opened the Stanislavsky Electrotheatre with The Bacchae, a show by Theodoros Terzopoulos from Greece. He didn’t open it with one of his own shows or a show by a Russian director. He opened it with a Greek show, one of the great tragedies. That was in itself completely unheard of. Russian directors are notoriously, pathologically jealous. They don’t want anyone else to do well on their stage. This guy comes in, recreates this theatre in his own image if you will, and the first show he opens is someone else’s. It was a statement that this place would be a multilingual place. I’m not talking about Greek or Russian now, but about languages of art. He brought in Romeo Castellucci and Heiner Goebbels, and it was a statement that our theatre is more than just a Russian theatre. It’s a Russian theatre with a great history—Stanislavsky basically started it—but we are going to go far beyond that. 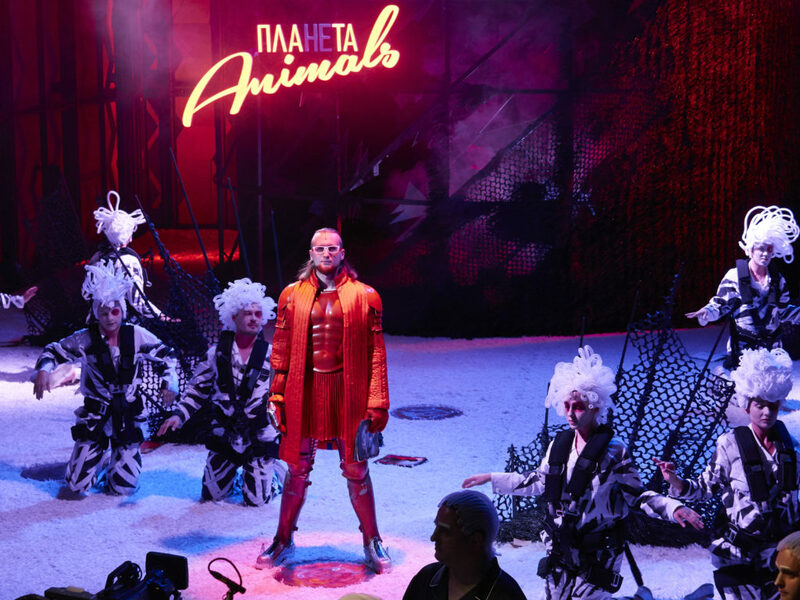 The Bacchae (2015), by Euripides, directed by Theodoros Terzopoulos at the Stanislavsky Electrotheatre, Moscow. Photo: Stanislavsky Electrotheatre. The next fabulous thing that Boris did was to turn over the small stage, and even the main stage on occasion, to his students. As the Artistic Director, he has produced some fourteen debuts of former students in the last year and a half. That is an astonishing number. He has opened that space up and made it a place of artistic languages in a way that I could never have imagined happening in Moscow. And, of course, he continues to do his own shows. Boris runs on 100-octane. He’s capable of creating shows, producing shows, imagining a new kind of theatre… and he does it all together at the same time. The Stanislavsky Electrotheatre is a very, very busy place. 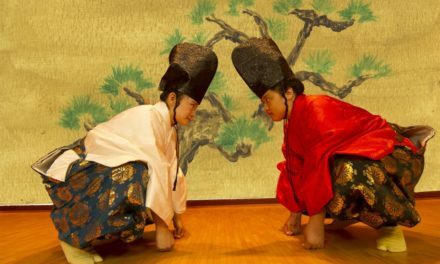 This interview is a collaboration between The Theatre Times’ Transcultural Collaborations Section (Editor: Yan Chen) and Russian Federation Section (Editor: Jessica Hinds-Bond).